Secretary-General António Guterres speaks at the IMF Development Committee meeting in Bali, Indonesia. 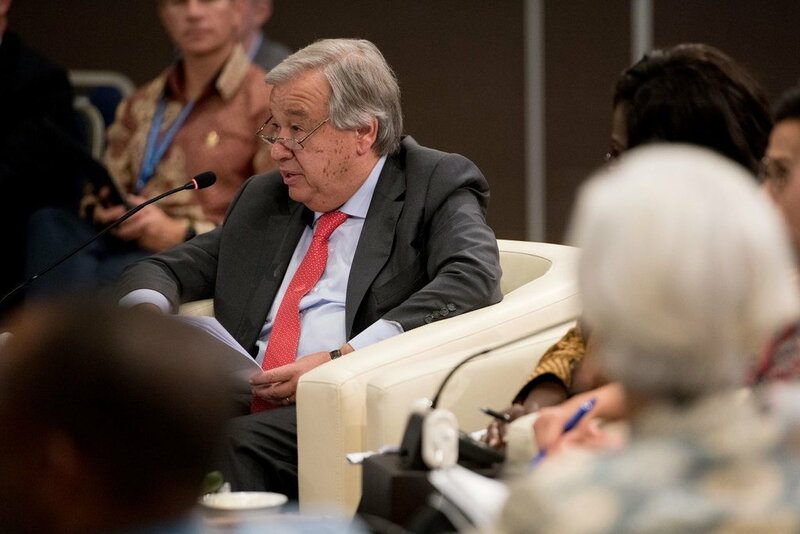 United Nations Secretary-General António Guterres has called for a surge in investment, long-term financing and global stability to overcome the obstacles to inclusive, resilient and environmentally sustainable global growth. Addressing finance ministers and central bank governors at International Monetary Fund (IMF)’s International Monetary and Financial Committee (IMFC), in Bali, Indonesia, the UN chief cautioned that high debt in many countries are limiting fiscal space and taking away much needed resources vital to achieve Sustainable Development Goals (SDGs). “This underlines the importance of international cooperation and of the full motivation and attraction of the private sector to fully play its role in the 2030 Agenda [for Sustainable Development],” said Mr. Guterres. In that context, he highlighted the importance of the full implementation of the Addis Ababa Action Agenda and recalled his Strategy to support Financing the 2030 Agenda, which he launched ahead of this year’s high-level general debate at the UN General Assembly. The Strategy sets out three priority action areas: aligning global financial and economic policies with the 2030 Agenda; enhancing national and regional sustainable financing and investment strategies; and encouraging financial inclusion and equitable access to finance for all, particularly for women and youth. Finance ministries and central banks are critical to all three areas, said Secretary-General Guterres, noting that with active engagement and cooperation, they can lead the way in framing policies needed to stabilize financial flows and minimize disruptions. “You bear the responsibility for formulating national budgets that support national sustainable development strategies that are fully aligned with the 2030 Agenda. You can set your fiscal policies to create positive incentives for longer-term sustainable investments and a transition to sustainable, equitable and inclusive growth,” he said. Strong international cooperation can also put an end to practices such as illicit flows of capital, money laundering and tax evasion, which drain vital resources away from developing countries and strengthen good-governance and tax-systems, added Mr. Guterres. Concluding his address, the Secretary-General highlighted the urgency to combat climate change. Also on Saturday, Mr. Guterres addressed IMF's Development Committee, where, alongside mobilizing financing and addressing debt challenges, he called for a greater focus on fast-evolving technologies given their importance for sustainable development. “Technological innovation opens new possibilities to address long-standing development challenges and to accelerate progress across the full range of the SDGs,” said the Secretary-General. 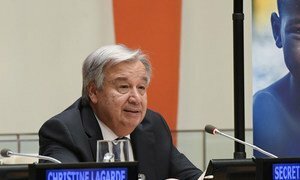 Highlighting tremendous gains in efficiency and productivity as a result of digitization, Mr. Guterres cautioned against a so called “premature deindustrialization” phenomenon – failure to absorb growing populations into manufacturing activities – as activities are re-shored to advanced economies. In this context, education and skills development will be vital, while the very nature of work will change, he continued, noting also the need for governments to strengthen social protection system, including, where appropriate, social transfers and targeted income support to smooth the transition of those most directly affected by these disruptions.